I’m Marg Kish and I’m an Authorised Marriage Celebrant. I’m a professional and experienced Wedding Celebrant. I love my job and want to help you create a truly Personal and Relaxed Ceremony for your Special Day. Your wedding ceremony should be a celebration of your love and commitment to one another. It should reflect your personalities, your values and your dreams for your life together. It should express your Love Story as well as celebrate your happiness. It should also pay due respect to the importance of the occasion. I can work with you to create the perfect ceremony for you. I can offer you a range of vows, readings and variations on a traditional or modern ceremony. You will be able to relax and enjoy your Special Day, because I will be there with you to take care of everything and make the Ceremony go smoothly. 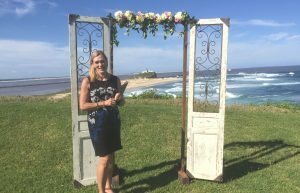 I am happy to conduct your Ceremony in the Hunter Valley, Newcastle, Lake Macquarie or Port Stephens, in the indoor or outdoor location of your dreams. Your ceremony will be based on your love story and each marriage ceremony is written specifically for each couple. I work in collaboration with you to create the ceremony of your dreams. On the big day, you can relax and enjoy the moment with confidence.